From the 2004 Local Elections , a leaflet from Mary Mannion of The Progressive Democrats who was running in Killaloe for a seat on Clare County Council. From the 2004 Local Elections , a leaflet from Máirín Quill of The Progressive Democrats running in Cork North East where she topped the poll and was elected on the first count. A Leaflet from Nicola Byrne of The Progressive Democrats when running in Malahide in the 2004 Local Elections. She polled 1052 votes and missed out on a seat. 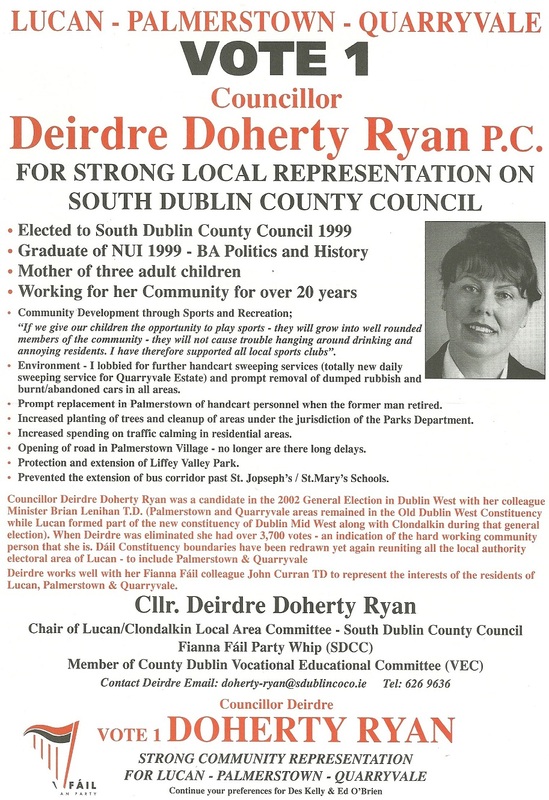 A Leaflet from Deirdre Doherty Ryan of Fianna Fail running in Lucan in the 2004 Local Elections. She polled 1218 votes and missed out on a seat. From the 2004 Local Elections a leaflet from Neil Clarke who was running for the Green Party in Letterkenny for both Donegal County Council and Letterkenny UDC. He polled 544 votes running for the County Council and missed out on a seat, however he polled 276 votes and was elected to Letterkenny Town Council.